The T cell Ig- and mucin domain–containing molecule-3 (Tim-3) negative immune checkpoint receptor demarcates functionally exhausted CD8+ T cells arising from chronic stimulation in viral infections like HIV. 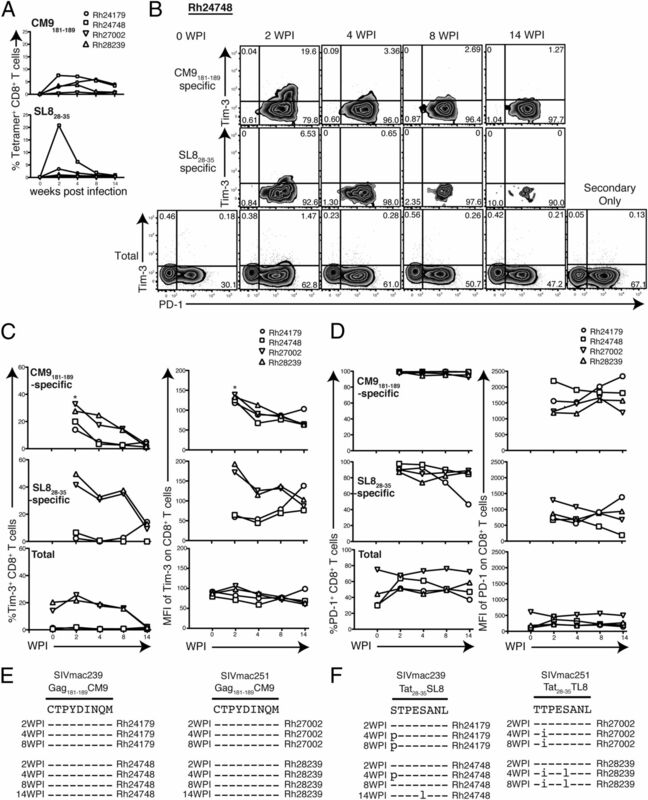 Tim-3 blockade leads to improved antiviral CD8+ T cell responses in vitro and, therefore, represents a novel intervention strategy to restore T cell function in vivo and protect from disease progression. However, the Tim-3 pathway in the physiologically relevant rhesus macaque SIV model of AIDS remains uncharacterized. We report that Tim-3+CD8+ T cell frequencies are significantly increased in lymph nodes, but not in peripheral blood, in SIV-infected animals. Tim-3+PD-1+CD8+ T cells are similarly increased during SIV infection and positively correlate with SIV plasma viremia. Tim-3 expression was found primarily on effector memory CD8+ T cells in all tissues examined. Tim-3+CD8+ T cells have lower Ki-67 content and minimal cytokine responses to SIV compared with Tim-3−CD8+ T cells. During acute-phase SIV replication, Tim-3 expression peaked on SIV-specific CD8+ T cells by 2 wk postinfection and then rapidly diminished, irrespective of mutational escape of cognate Ag, suggesting non-TCR–driven mechanisms for Tim-3 expression. Thus, rhesus Tim-3 in SIV infection partially mimics human Tim-3 in HIV infection and may serve as a novel model for targeted studies focused on rejuvenating HIV-specific CD8+ T cell responses. Virus-specific CD8+ T cells play a crucial role in the control of SIV and HIV infections (1–10). Recent studies demonstrate that effector memory CD8+ T cells elicited by vaccination with SIV protein–expressing rhesus CMV vectors mediate stringent protection from SIV replication and can even clear latent SIV reservoirs (11, 12). Additionally, the magnitude and function of SIV-specific effector T cells are strongly associated with protection following live-attenuated SIV vaccination (13). These data indicate that the continuous generation and maintenance of robust effector memory HIV/SIV-specific CD8+ T cells in peripheral tissues may afford a strategy for clearance of virus. Therefore, understanding T cell effector regulation is crucial to improving T cell–based vaccine strategies. Failure of the host immune system to control HIV/SIV infection is related, in part, to functional impairment of virus-specific CD8+ T cells (14–22). In the presence of a high antigenic load, such as in chronic viral infections, T cells enter a state of exhaustion (23). During this period, T cells express several inhibitory immune receptors that fine-tune the strength of activating signals, resulting in negative feedback. Although programmed death receptor-1 (PD-1) is an early, sustained marker of immune exhaustion (14, 15, 18–22), recent studies showed that the surface glycoprotein, T cell Ig- and mucin domain–containing molecule-3 (Tim-3), appears to be a later marker of T cell dysfunction, which is defined by defective proliferative capacity and cytokine production (16, 24–29). Our previous observations revealed that increased Tim-3 expression on HIV-specific CD8+ T cells is associated with progressive HIV infection (25), and other investigators showed increased Tim-3 expression on CD8+ T cells in patients with higher levels of HIV (30, 31) and HCV (17, 26, 32) infection. Additionally, it is evident from several studies that Tim-3+CD8+ T cells are an abundant but entirely distinct and divergent population from prototypical anergic effector or memory CD8+ T cells (33, 34). Blockade of Tim-3 interaction, alone or in conjunction with PD-1 blocking, was shown to reverse effector T cell defects, reduce viremia, and ameliorate disease severity in the setting of several chronic viral infections (15, 22, 24, 26, 27). Mechanistically, Tim-3 blockade allows Tim-3+CD8+ T cells to respond more efficiently to TCR stimulation (17, 25, 35), setting the stage for improved effector T cell responses. The Tim-3 pathway in nonhuman primates has yet to be fully explored. Given the importance of nonhuman primates as models of human disease, understanding the similarities and differences between human and nonhuman primate Tim-3 signaling would provide additional avenues to study the therapeutic effects of Tim-3 blockade. In particular, nonhuman primates provide the most physiologically relevant model for HIV/AIDS. Therefore, we report on the profile and characterization of Tim-3 expression in the peripheral blood and organized lymphoid tissues in SIV-infected rhesus macaques. Indian rhesus macaques (Macaca mulatta), housed at the Oregon National Primate Research Center and used in this study, were cared for according to the laws, regulations, and guidelines set forth by the U.S. Department of Agriculture (e.g., the Animal Welfare Act and its regulations, and the Animal Care Policy Manual), Institute for Laboratory Animal Research (e.g., Guide for the Care and Use of Laboratory Animals, 8th edition), Public Health Service, National Research Council, Centers for Disease Control and Infection, and the Association for Assessment and Accreditation of Laboratory Animal Care International. The Oregon Health and Science University Institutional Animal Care and Use Committee approved the research involving animals reported in this study. Animals were infected with SIVsmE660, SIVmac239, or SIVmac251 for other, unrelated projects. Cryopreserved human and rhesus PBMCs were thawed and lysed, and the RNA was purified using an RNeasy Plus Mini Kit (QIAGEN, Venlo, Limburg, the Netherlands). Total RNA was reverse transcribed with the Superscript III First-Strand Synthesis System (Invitrogen, Carlsbad, CA) using primers specific for Tim-3. RNA complementary to the cDNA was removed using RNase H (Invitrogen). ExPASy translate tool was used to translate obtained DNA sequences to protein sequences. These sequence data were deposited in the DNA Data Bank of Japan (http://www.ddbj.nig.ac.jp) under accession numbers AB924452 (human) and AB924453 (rhesus). Cryopreserved PBMCs from humans not infected with HIV, as well as animals that were infected or not with SIV, were thawed and lysed in RIA precipitation buffer (Thermo Scientific, Waltham, MA) and then incubated with peptide-N-glycosidase F (PNGase F; New England BioLabs, Ipswich, MA). Samples were separated by 12% SDS-PAGE and blotted onto a nitrocellulose membrane (Amersham, Buckinghamshire, U.K.). The membrane was blocked in 5% milk for an hour and incubated overnight with polyclonal goat anti-human Tim-3 Ab (R&D Systems, Minneapolis, MN). Rabbit anti-goat HRP-conjugated Ab (Invitrogen) was used as a secondary Ab, and blots were developed by the chemiluminescent method using ECL Prime Western Blotting Detection Reagent (Amersham). The following directly conjugated Abs were obtained from BD Biosciences (San Jose, CA): Alexa Fluor 700–conjugated anti-CD3 (SP34-2), PE-CF594–conjugated anti-CD4 (L200), allophycocyanin- or allophycocyanin-H7–conjugated anti-CD8 (SK1), V450-conjugated anti-CD16 (3G8), PE-Cy7–conjugated anti-CD56 (NCAM16), PE-Cy5–conjugated anti-CD95 (DX2), allophycocyanin-conjugated anti–IFN-γ (B27), and PE-conjugated anti–Ki-67 (B56). PE-conjugated anti–PD-1 (EH12.2H7), PE-Cy7–conjugated CD28 (CD28.2), and Alexa Fluor 488–conjugated anti-rabbit IgG (H+L) Abs were purchased from BioLegend (San Diego, CA), eBioscience (San Diego, CA), and Invitrogen, respectively. Unconjugated Tim-3 polyclonal Abs (Life BioScience, Albuquerque, NM and Novus Biologicals, Littleton, CO) were used in concert with Alexa Fluor 488–conjugated anti-rabbit IgG (H+L) Ab. A biotinylated anti-human Tim-3 polyclonal Ab and biotinylated goat polyclonal Abs (R&D System) were used in concert with Qdot 605-conjugated streptavidin (Invitrogen). PE-conjugated Tim-3 mAbs were obtained from R&D Systems (215008 and 344823) and BioLegend (F38-2E2). Allophycocyanin-conjugated Mamu-A*01 SIV Gag181–189 CM9 (CTPYDINQM) tetramer and allophycocyanin-conjugated Mamu-A*01 SIV Tat28–35 SL8 (STPESANL) tetramer were produced as described previously (36). An aqua amine reactive dye (Invitrogen) was used to exclude dead cells. In some experiments, cells were fixed in 2% paraformaldehyde (PFA), permeabilized with BD FACS permeabilizing solution 2 (BD Biosciences), and stained for Ki-67 and IFN-γ (BD Biosciences). Cells were then fixed with 2% PFA and analyzed by flow cytometry using a four-laser BD Fortessa instrument (Becton Dickinson). Anti-mouse IgG-coated beads (Invitrogen) were reacted with each fluorochrome-conjugated Ab separately and used for software-based compensation. Cells were analyzed with FlowJo software (TreeStar, Ashland, OR). T cell stimulation and intracellular cytokine staining were performed similarly to a previous detailed description (37). Briefly, 5 × 105 cryopreserved PBMCs or lymph node (LN) cells were incubated for 1 h at 37°C in 200 μl RPMI 1640 containing 10% bovine growth serum and antibiotics with anti-CD28, anti-CD49d, and 10 μM the synthetic peptide SIV Gag181–189CM9 (CTPYDINQM). Then, 10 μg/ml brefeldin A was added, and the cells were incubated for an additional 8 h at 37°C. Cells were washed in buffer (PBS with 10% serum), stained for surface expression of CD3, CD4, and CD8 markers, and fixed in 2% PFA at 4°C. Cells were then permeabilized in wash buffer containing 1% saponin and stained for the expression of cytokines IFN-γ and TNF-α. Stained cells were acquired on a custom four-laser BD Fortessa flow cytometer (Becton Dickinson) with FACSDiva software and analyzed with FlowJo software (TreeStar). Statistical analyses were performed using GraphPad Prism statistical software (GraphPad, San Diego, CA). The Wilcoxon matched-pairs signed-rank test and the Mann–Whitney U test were performed for comparative statistical analysis. The Spearman’s r test was performed for correlation statistical analysis. To explore the role of Tim-3 in the rhesus macaque model of AIDS, we first determined whether Tim-3 was expressed on rhesus cells. The rhesus macaque genome contains a predicted open reading frame with high homology (79.7%) to human HAVCR2 (38, 39), and the amino acid sequence also shows high similarity (87.8%) to human Tim-3 (Fig. 1A). Despite the high sequence homology between human and rhesus Tim-3, no Ab reagent has been described that reacts with rhesus Tim-3. Using several commercially available murine and human monoclonal and polyclonal Tim-3 Abs, we identified two polyclonal Abs with cross-reactivity to rhesus macaque PBMCs by flow cytometry and Western blot analysis (Fig. 1B, Supplemental Fig. 1). We observed a single band with a molecular mass of 30 kDa in PBMCs derived from both uninfected and SIV-infected animals treated with PNGase F. PBMCs derived from an uninfected human subject yielded two bands: one in line with rhesus macaque Tim-3 and an extra band with a molecular mass of 60 kDa. In the absence of PNGase F incubation, more bands were observed, suggesting potential modification of Tim-3 by glycosylation (29, 40) (data not shown). Detection and expression of rhesus Tim-3 in T cells derived from blood and LNs. (A) Alignment shows amino acid sequences of human Tim-3 (Hu Tim-3) and rhesus Tim-3 (Rh Tim-3). Highlighted sequences indicate homology between human and rhesus Tim-3. Dashes indicate gaps in alignment. (B) Bands were blotted with polyclonal anti-human Tim-3 Ab. (C) Flow plots depict Tim-3 expression on CD8+ T cells from PBMCs and LNs in representative animals that were or were not infected with SIV. Graphs show the frequency (%) of Tim-3+CD8+ T cells from PBMCs (circle) and LNs (square) in noninfected (filled) and SIV-infected (open) animals (noninfected PBMCs, n = 16; SIV-infected PBMCs, n = 26; noninfected LNs, n = 12; SIV-infected LNs, n = 26). (D) Flow plots depict Tim-3 expression on CD4+ T cells from PBMCs and LNs in representative noninfected and SIV-infected animals. Graphs show the frequency (%) of Tim-3+CD4+ T cells from PBMCs (circle) and LNs (square) in noninfected (filled) and SIV-infected (open) animals (noninfected PBMCs, n = 16; SIV-infected PBMCs, n = 26; noninfected LNs, n = 12; SIV-infected LNs, n = 26). (E) Flow plots depict Tim-3 and PD-1 coexpression on CD8+ T cells from PBMCs and LNs in representative noninfected and SIV-infected animals. Graphs show the frequency (%) of Tim-3+PD-1+CD8+ T cells from PBMCs and LNs in noninfected and SIV-infected animals (noninfected PBMCs, n = 12; SIV-infected PBMCs, n = 17; noninfected LNs, n = 12; SIV-infected LNs, n = 20). A Mann–Whitney U test was performed for statistical analysis. Control cells were stained with the secondary Abs without using the anti–Tim-3 primary Ab. Both SIVsmE660- and SIVmac239-infected macaques were used for these analyses. Hu, human; Rh, rhesus; SIV−, not infected with SIV; SIV+, SIV infected. Using the anti–Tim-3 polyclonal Ab that gave superior flow staining resolution (Supplemental Fig. 1), we first stained rhesus PBMCs and examined Tim-3 expression on CD8+ T cells and NK cells. Consistent with our previous observation in humans (41), Tim-3 expression was higher on NK cells than on CD8+ T cells, further validating our staining protocol (Supplemental Fig. 2). However, Tim-3 expression increases on CD8+ T cells during progressive HIV infection (25). To determine whether SIV replication induces similar expansion of Tim-3+CD8+ T cells following SIV infection, we compared the levels of Tim-3 on CD8+ T cells in both PBMCs and LNs in uninfected and SIVsmE660- or SIVmac239-infected animals (Supplemental Table I). Tim-3 expression was greater on CD8+ T cells compared with CD4+ T cells in uninfected animals, as was observed previously in human studies (Fig. 1C, 1D) (41, 42). We observed that Tim-3 levels on CD8+ T cells from PBMCs (Fig. 1C) were similar between uninfected and SIV-infected animals. However, the frequency of Tim-3+CD8+ T cells was significantly greater in LNs from SIV-infected animals compared with uninfected animals (Fig. 1C). This result was independent of the infecting SIV strain, because no statistically significant difference in the frequency of Tim-3+CD8+ T cells was observed between SIVsmE660- and SIVmac239-infected animals (data not shown). No significant difference in Tim-3 levels on CD4+ T cells was observed between uninfected and SIV-infected animals for PBMCs or LNs (Fig. 1D). We also observed a significant increase in LN-derived CD8+ T cells coexpressing Tim-3 and PD-1 in SIV-infected animals (Fig. 1E). Because we observed increased levels of Tim-3 in SIV-infected animals, we next explored the relationship between Tim-3 expression and SIV plasma viremia. LN-derived Tim-3+CD8+ T cells trended toward a positive association with SIV viremia; however, this was not statistically significant (r = +0.42, p = 0.08, Fig. 2A). In contrast, LN-derived Tim-3+PD-1+CD8+ T cells positively correlated with SIV plasma viremia (r = +0.008, p = 0.005, Fig. 2C). Neither Tim-3+CD8+ T cells nor Tim-3+PD-1+CD8+ T cells from PBMCs correlated significantly with SIV viremia. Correlation of Tim-3–expressing CD8+ T cells and plasma SIV load. (A) Graphs show correlation of plasma SIVsmE660 viral load and frequency of Tim-3+CD8+ T cells from PBMCs (n = 20) and LNs (n = 19). (B) Graphs show correlation of plasma SIV smE660 viral load and frequency of Tim-3+CD8+ T cells from PBMCs and LNs (n = 16 each). (C) Graphs show correlation of plasma SIV smE660 viral load and frequency of Tim-3+PD-1+CD8+ T cells from PBMCs and LNs (n = 16 each). A Spearman’s r test was performed for statistical analysis. All data points for SIVsmE660 vRNA and Tim-3 expression levels are from the same samples (plasma and PBMC, respectively) taken at the same time point. vRNA Eq, viral RNA copy equivalents. Effector memory CD8+ T cells were reported to prevent SIV dissemination following acquisition (11–13). 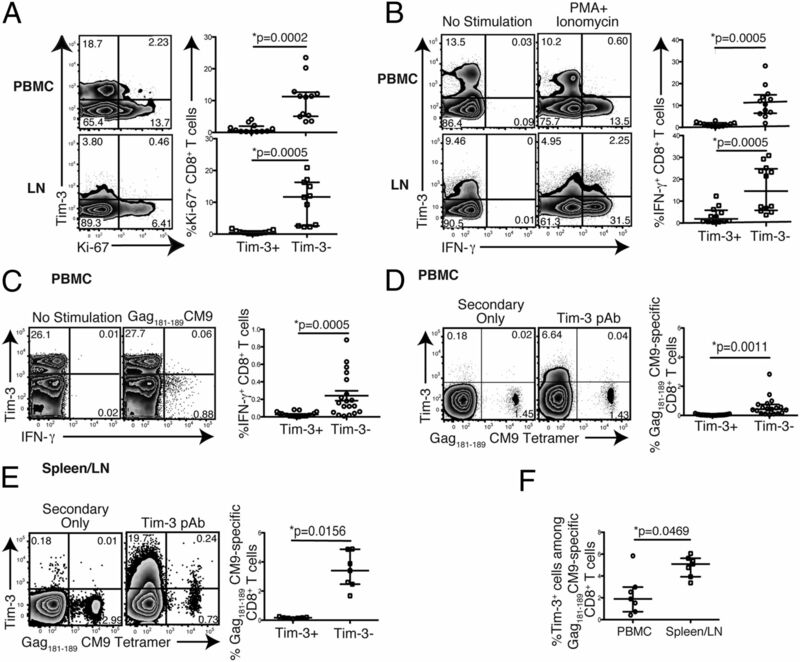 Therefore, we examined the phenotype of Tim-3+ T cells in PBMCs, LNs, and spleen (19). The greatest representation of Tim-3+ cells was found within the effector memory (CD28−CD95+) CD8+ T cell compartment, with few, if any, cells represented in the naive (CD28+CD95−) or central memory T cell (CD28+CD95+) pool in PBMCs, LNs, or spleens in SIV-infected animals (Fig. 3). Phenotypic assessment of rhesus Tim-3–expressing CD8+ T cells in various tissues. (A) Flow plots show the gating of naive (CD28+CD95−) (N), effector memory (CD28−CD95+) (EM), and central memory (CD28+CD95+) (CM) CD8+ T cells from SIV-infected PBMCs, LNs, or spleen in a representative animal. (B) Flow plots depict Tim-3 expression on N, EM, and CM CD8+ T cells from PBMCs, LNs, or spleen in a representative SIVsmE660-infected animal. Graphs show the frequency (%) of Tim-3+ N, EM, and CM CD8+ T cells from SIV-infected PBMCs (n = 9), LNs (n = 9), or spleen (n = 8). A Wilcoxon matched-pairs signed-rank test was performed for statistical analysis. We (25) and other investigators (42) showed that Tim-3+CD8+ T cells are unable to proliferate and lack cytokine responsiveness to polyclonal or Ag-specific stimulation, indicating that Tim-3 marks dysfunctional CD8+ T cell populations. Therefore, we assessed ex vivo coexpression of Tim-3 and the nuclear protein Ki-67, a marker of proliferating cells, in PBMC- and LN-derived CD8+ T cells from both SIV-infected and uninfected macaques. Regardless of SIV infection status, most Ki-67+CD8+ T cells in both PBMCs and LNs lacked Tim-3 expression (Fig. 4A). We next examined the IFN-γ response to either mitogenic stimulation with PMA and calcium ionophore ionomycin in PBMCs from SIV-infected animals or to the immunodominant Gag181–189 CM9 SIV peptide in PBMCs from SIV-infected Mamu-A*01+ animals. The production of IFN-γ in response to either PMA + ionomycin or Gag181–189 CM9 SIV peptide stimulation was principally from Tim-3− cells, especially from Gag181–189 CM9–specific CD8+ T cells when stimulated with cognate peptide (Fig. 4B, 4C). These data demonstrate that Tim-3 marks poorly functional effector memory CD8+ T cells in PBMCs and LNs. Tim-3–expressing CD8+ T cells have impaired proliferative capacity and cytokine responses. (A) Flow plots depict representative Ki-67 and Tim-3 expression in PBMCs and LNs. Graphs show the frequency (%) of Tim-3+Ki-67+ and Tim-3−Ki-67+ CD8+ T cells in PBMCs (n = 12) and LNs (n = 11). Cells from both SIV-naive and SIV-infected animals were used. (B) Flow plots depict representative IFN-γ and Tim-3 expression in PBMCs (n = 12) and LNs (n = 12) from SIV-infected animals. Graphs show the frequency (%) of Tim-3+IFN-γ+ and Tim-3−IFN-γ+ CD8+ T cells in PBMCs and LNs from SIV-infected animals following mitogen stimulation. (C) Flow plots depict IFN-γ and Tim-3 expression in CD8+ T cells from PBMCs, with or without Gag181–189 CM9 peptide stimulation, in a representative Mamu-A01+ animal. Graph shows the frequency (%) of Tim-3+IFN-γ+ and Tim-3−IFN-γ+ CD8+ T cells in PBMCs from Mamu-A01+ SIV-infected animals (n = 14). (D) Flow plots depict Tim-3 expression on Gag181–189 CM9–specific CD8+ T cells stained with CM9 tetramer in a representative animal. Graph shows the frequency (%) of Tim-3− and Tim-3+ Gag181–189 CM9–specific CD8+ T cells in PBMCs from SIV-infected animals (n = 14). (E) Flow plots represent Tim-3–expressing Gag181–189 CM9-specific CD8+ T cells in secondary lymphoid tissues derived from LNs and spleen from Mamu-A01+ SIVsmE660- and SIVmac239/251-infected animals. (F) Frequency of Tim-3–expressing Gag181–189 CM9–specific CD8+ T cells in PBMCs and in secondary lymphoid tissues. Control cells were stained with the secondary Abs without using the anti–Tim-3 primary Ab. A Wilcoxon matched-pairs signed-rank test was performed for statistical analysis. We further examined the expression of Tim-3 on SIV-specific CD8+ T cells by Mamu-A*01:Gag181–189 CM9 tetramer staining. We observed that, in PBMCs, Gag181–189 CM9–specific CD8+ T cells from chronically SIV-infected animals predominantly lacked Tim-3 expression (Fig. 4D). However, Tim-3–expressing Gag181–189 CM9–specific CD8+ T cells were present in the secondary lymphoid organs of these animals (Fig. 4E). Furthermore, the proportion of Tim-3–expressing cells within the Gag181–189 CM9–specific CD8+ T cells was significantly higher in the spleen and LNs in comparison with PBMCs (Fig. 4F). We previously demonstrated that Tim-3 expression is higher on certain HIV-specific CD8+ T cells (25), and this appears to render high Tim-3–expressing HIV-specific T cells vulnerable to regulatory T cell–mediated suppression (43). Because Tim-3 expression was lower on Gag181–189 CM9–specific CD8+ T cells in PBMCs in chronically SIV-infected macaques, we reasoned that Tim-3 levels may have been downregulated during the acute stage of infection. Therefore, we assessed the Tim-3 expression kinetics on SIV-specific CD8+ T cells in PBMCs from two animals infected with SIVmac239 (Rh24179 and Rh24748) and from two animals infected with SIVmac251 (Rh27002 and Rh28239) during the acute phase of infection using Gag181–189 CM9 and Tat28–35 SL8 tetramers (3). The frequency of Gag181–189 CM9–specific CD8+ T cells showed stable kinetics in all animals through the first 14 wk of infection (Fig. 5A). Tat28–35 SL8–specific CD8+ T cells were present at the highest frequency at 2 wk postinfection (w.p.i. ), but they decreased in frequency thereafter. Tim-3 expression peaked on both Gag181–189 CM9– and Tat28-35 SL8–specific CD8+ T cells by 2 w.p.i. and declined thereafter (Fig. 5B, 5C). Both the frequency and mean fluorescence intensity (MFI) of Tim-3 were higher in Gag181–189 CM9–specific CD8+ T cells compared with Tat28–35 SL8–specific CD8+ T cells. We observed that, even at this early stage of infection, the frequency of Ki-67–expressing Tim-3+ total or effector memory CD8 T cells was very low compared with Tim-3− cells (Supplemental Fig. 3). Interestingly, most Tim-3+CD8+ T cells showed high levels of PD-1 expression compared with HIV-specific CD8 T cells, for which these levels were much lower (18, 19, 25, 44, 45). However, we noted that the frequency of PD-1+ cells was greater in both SIV-specific CD8+ T cells than in total CD8+ T cells (Fig. 5B, 5D). The MFI of PD-1 was higher for Gag181–189 CM9–specific CD8+ T cells compared with Tat28–35 SL8–specific CD8+ T cells (Fig. 5B, 5D). Both the frequency and MFI of PD-1 in Gag181–189 CM9–specific CD8+ T cells remained high, whereas they declined in Tat28–35 SL8–specific CD8+ T cells after 4 w.p.i. (Fig. 5B, 5D), contrasting with Tim-3 kinetics. The Tat28–35 SL8 epitope mutates early in infection, whereas the Gag181–189 CM9 epitope is stable or mutates late in infection (46, 47). Consistent with our findings, no viral escape mutations were observed in Gag181–189 CM9 in either animal through 14 wk of infection, but both animals harbored an escape mutation within Tat28–35 SL8 by 4 w.p.i (Fig. 5E, 5F). Tim-3 kinetics were not synchronized with viral escape in Tat28–35 SL8. However, PD-1 levels declined coincidently with Tat28–35 SL8 escape. 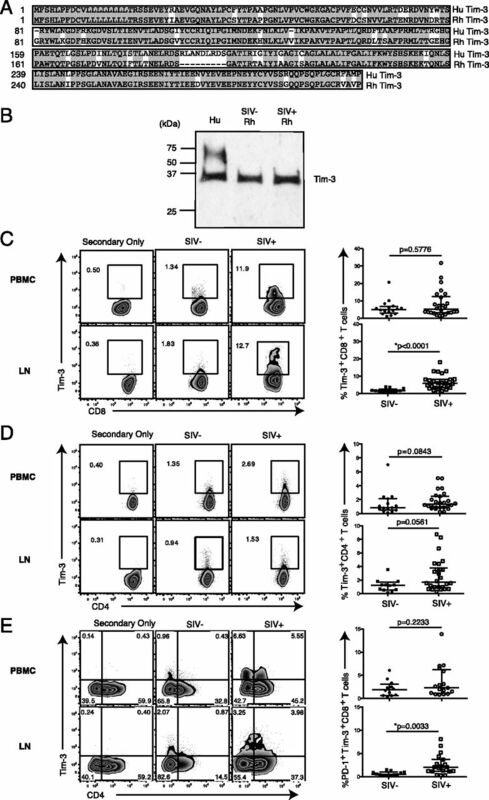 These data suggest that PD-1 expression is driven by antigenic stimulation, as previously described (19), whereas Tim-3 expression appears to be driven by additional stimuli and is unaffected by viral escape. Kinetics of Tim-3 and PD-1 expression on SIV-specific CD8+ T cells during acute SIV infection. (A) Graphs show the change in frequency (%) of Gag181–189 CM9– or Tat28–35 SL8–specific CD8+ T cells in four animals: Rh24179, Rh24748, Rh27002, and Rh28239. (B) Flow plots show the change in Tim-3 and PD-1 on Gag181–189 CM9–specific, Tat28–35 SL8–specific, or total CD8+ T cells in a representative animal (Rh24748). (C) Graphs show the change in frequency (%) (left panels) and MFI (right panels) of Tim-3 in Gag181–189 CM9–specific, Tat28–35 SL8–specific, or total CD8+ T cells in four animals. (D) Graphs show the change in frequency (%) (left panels) and MFI (right panels) of PD-1 in Gag181–189 CM9-specific, Tat28–35 SL8–specific, or total CD8+ T cells in two animals. (E) Alignment shows SIV genome sequence of the CM9 region at each time point. Dashes indicate sequence identity. (F) Alignment shows SIV genome sequence of the SL8 region at each time point. Dashes indicate sequence identity. Control cells were stained with the secondary Abs without using the anti–Tim-3 primary Ab. WPI, wk postinfection. Negative immune checkpoints are crucial in regulating effector CD8+ T cell responses to chronic viral infections (14–28, 35). The current study was conducted to determine whether the Tim-3 pathway is active in nonhuman primates. We demonstrate in this article the detection of rhesus Tim-3 and provide evidence that it is upregulated in CD8+ T cells derived from secondary lymphoid organs of SIV-infected macaques. Tim-3+CD8+ T cells exhibit a predominantly effector memory phenotype and represent a dysfunctional cellular population, suggesting that the Tim-3 pathway is active in the rhesus macaque SIV model of AIDS. Thus, rhesus macaques may represent an appropriate model for interventional studies to improve antiviral CD8+ T cell responses against chronic pathogens, such as SIV. LN-resident CD8+ T cell responses were shown recently to predict the efficacy of live-attenuated SIV vaccines (13), supporting the importance of evaluating tissue sites for understanding antiviral CD8+ T cell activity. Our finding that Tim-3 is increased on LN-derived CD8+ T cells in SIV-infected animals reveals the importance of evaluating secondary lymphoid organs in SIV or HIV patients, because viral reservoirs are predominantly located within CD4+ T follicular helper cells in LNs and in tissue macrophages (48). Several negative immune checkpoint receptors, including Tim-3, are found in abundance in the tumor-infiltrating environment compared with those in normal tissues or peripheral blood (49), suggesting that T cell immune dysfunction may be occurring principally within tissue sites. Stationing of SIV-specific effector memory CD8+ T cells at portals of viral entry can potently inhibit the establishment of infection (11). Our findings show that effector memory CD8+ T cells from various tissues predominantly express Tim-3. Galectin-9 is regarded as a soluble ligand for Tim-3 (29, 50) and is found at high levels in the plasma from patients with high HIV plasma viremia (51), even during HIV acquisition (52). We propose that LN-derived, SIV-specific Tim-3+CD8+ T cells are rendered dysfunctional through galectin-9–Tim-3 interactions, and this may be occurring during the acute phase of infection. Therefore, it is likely that the transient upregulation of Tim-3 expression in acute infection would lead to the early impairment of SIV-specific effector memory CD8+ T cells. Phosphatidylserine and HMGB1 also were identified as the other ligands for Tim-3, but their functional effects on CD8+ T cells are still largely unknown (53, 54). It is also possible that these ligands render CD8+ T cells dysfunctional via Tim-3 ligation. We observed that Gag181–189 CM9–specific CD8+ T cells expressed higher Tim-3 levels in comparison with Tat28–35 SL8–specific CD8+ T cells during acute SIV infection. When Tim-3 levels were tracked during SIV infection, we observed that they were unaffected by viral escape mutations; this contrasts with PD-1 expression levels, which tend to decline during escape, as demonstrated previously (19). Recent studies further reveal that several of the common γ-chain cytokines regulate Tim-3 expression on CD8+ T cells, independent of antigenic stimulation (41, 54–56). We interpret these results to indicate that persistent Tim-3 expression on virus-specific CD8+ T cells does not require continuous antigenic stimulation. In chronic HIV infection, we (25) and other investigators (31, 43) reported variable increases in the levels of Tim-3 expression on different HIV-specific CD8+ T cells. Our observation that Gag181–189 CM9–specific CD8+ T cells lacked Tim-3 expression in PBMCs from chronically SIV+ primates may suggest that different levels of Tim-3 also occur in different SIV-specific CD8+ T populations. Blockade of Tim-3 by anti–Tim-3 Ab or recombinant Tim-3 reinvigorates CD8+ T cell function (24–26, 32, 50, 55), and it may be more effective in the reversal of T cell dysfunction compared with other negative-inhibitory checkpoints, because Tim-3+CD8+ T cells are defective in both cytokine and proliferative capacity in humans and rhesus macaques. Recent findings highlight the potential of dual Tim-3/PD-1 blockade as a potent therapy for improving antiviral T cell responses. This dual Tim-3/PD-1 blockade substantially suppressed viremia and improved survival in several models of chronic infection (24, 26). Tim-3+PD-1+CD8+ T cells are dysfunctional, and they also appear to secrete IL-10 in abundance compared with single-positive cells in mice (24). Indeed, combination blockade of Tim-3 and PD-1 was shown to substantially improve antiviral T cell immunity and, more importantly, suppress viral load (24, 26, 57, 58). Our data demonstrate that Tim-3+PD-1+CD8+ T cells are linked to viral persistence in SIV infection; thus, targeting this population with a dual blockade may be more effective at improving antiviral CD8+ T cell activity than a single Tim-3 or PD-1 blockade alone. During chronic SIV infection, most Tim-3+CD8+ T cells did not coexpress PD-1. This might reflect the hierarchical expression and different regulation patterns of these two negative-checkpoint molecules. In acute infection, given the observation that Tim-3 and PD-1 were coexpressed on SIV-specific CD8+ T cells, TCR stimulation is known to induce and maintain PD-1 expression. We posit that viral mutations result in the loss of TCR stimulation in specific CD8+ T cells, leading to the downregulation of PD-1 (19), whereas Tim-3 expression remains stable as a result of its regulation, which appears to be induced and maintained by a series of common γ-chain cytokines (56). Our data suggest prolonged expression of Tim-3 after PD-1 downregulation. The therapeutic efficacy of single or dual blockade of Tim-3 or PD-1 may be relevant as may be the timing of intervention to improve or restore anti-SIV T cell immune control. Assessing the effects of combination antiretroviral therapy (cART) on rhesus Tim-3 expression during SIV infection will be an important next step in our studies, because Tim-3 levels in some HIV+ patients do not decline following suppressive cART (25). In conclusion, we established a method to detect Tim-3 in rhesus macaques and demonstrate that Tim-3+CD8+ T cells are increased after SIV infection, mark dysfunctional T cells, and, thus, recapitulate Tim-3 characteristics observed in humans and mice. With the management of HIV treatment advocating for the early institution of cART during acute infection (59, 60), our findings suggest that, although challenging, this should be supplemented with an immune checkpoint blockade to improve host anti-HIV CD8+ T cell function early during infection. Overall, our findings will aid in our understanding of the Tim-3 pathway in HIV and SIV persistence and afford an opportunity to evaluate preclinical targeting of Tim-3 to improve antiviral and antitumor CD8+ T cell immunity. We thank C. Lai, W. Tsai, H. Lin, and W. Wang (University of Hawaii) for critical input in Western blot analysis and Dr. Alika Maunakea (University of Hawaii) for guidance with sequence alignments. This work was supported in part by Grant AI027757 from the National Institutes of Health, National Institute of Allergy and Infectious Diseases, Centers for AIDS Research; Grants P51 OD011092 and P51 OD011104 from the National Center for Research Resources; and the Creative and Novel Ideas in HIV Research Program through a supplement to the University of California San Francisco–Gladstone Institute of Virology and Immunology Center for AIDS Research funding (P30 A1027763 to L.C.N.). This funding was made possible by collaborative efforts of the Office of AIDS Research, the National Institute of Allergy and Infectious Diseases, and the International AIDS Society. E.S. is a Silver Family Foundation Scholar. This work was also supported by Delaney AIDS Research Enterprise Grant AI096109. The content is solely the responsibility of the authors and does not necessarily represent the official views of the National Institutes of Health. The sequences presented in this article have been submitted to the DNA Data Bank of Japan (http://www.ddbj.nig.ac.jp/) under accession number AB924453.
. 1999. In vivo migration and function of transferred HIV-1-specific cytotoxic T cells. Nat. Med. 5: 34–41.
. 2004. HIV and SIV CTL escape: implications for vaccine design. Nat. Rev. Immunol. 4: 630–640.
. 1999. Dramatic rise in plasma viremia after CD8(+) T cell depletion in simian immunodeficiency virus-infected macaques. J. Exp. Med. 189: 991–998.
. 2009. Immune control of an SIV challenge by a T-cell-based vaccine in rhesus monkeys. Nature 457: 87–91.
. 1998. Administration of an anti-CD8 monoclonal antibody interferes with the clearance of chimeric simian/human immunodeficiency virus during primary infections of rhesus macaques. J. Virol. 72: 164–169.
. 2007. Gag-specific CD8+ T lymphocytes recognize infected cells before AIDS-virus integration and viral protein expression. J. Immunol. 178: 2746–2754.
. 2009. Effector memory T cell responses are associated with protection of rhesus monkeys from mucosal simian immunodeficiency virus challenge. Nat. Med. 15: 293–299.
. 2012. Lymph node T cell responses predict the efficacy of live attenuated SIV vaccines. Nat. Med. 18: 1673–1681.
. 2008. TIMs: central regulators of immune responses. J. Exp. Med. 205: 2699–2701.
. 2008. HIV-specific T-cells accumulate in the liver in HCV/HIV co-infection. PLoS ONE 3: e3454.
. 2012. Role of PD-1 in HIV pathogenesis and as target for therapy. Curr. HIV/AIDS Rep. 9: 81–90.
. 2012. Age-related expansion of Tim-3 expressing T cells in vertically HIV-1 infected children. PLoS ONE 7: e45733.
. 2013. T cell anergy, exhaustion, senescence, and stemness in the tumor microenvironment. Curr. Opin. Immunol. 25: 214–221.
. 2002. Escape in one of two cytotoxic T-lymphocyte epitopes bound by a high-frequency major histocompatibility complex class I molecule, Mamu-A*02: a paradigm for virus evolution and persistence? J. Virol. 76: 11623–11636.
. 2012. Increased bovine Tim-3 and its ligand expressions during bovine leukemia virus infection. Vet. Res. 43: 45.
. 2011. Genome sequencing and comparison of two nonhuman primate animal models, the cynomolgus and Chinese rhesus macaques. Nat. Biotechnol. 29: 1019–1023.
. 2003. The TIM gene family: emerging roles in immunity and disease. Nat. Rev. Immunol. 3: 454–462.
. 2011. Protective HIV-specific CD8+ T cells evade Treg cell suppression. Nat. Med. 17: 989–995.
. 2013. Cutting edge: Prolonged exposure to HIV reinforces a poised epigenetic program for PD-1 expression in virus-specific CD8 T cells. J. Immunol. 191: 540–544.
. 2013. CD8 down-regulation and functional impairment of SIV-specific cytotoxic T lymphocytes in lymphoid and mucosal tissues during SIV infection. J. Leukoc. Biol. 93: 943–950.
. 2011. Pyrosequencing reveals restricted patterns of CD8+ T cell escape-associated compensatory mutations in simian immunodeficiency virus. J. Virol. 85: 13088–13096.
. 2012. Rapid decrease of plasma galectin-9 levels in patients with acute HIV infection after therapy. Tohoku J. Exp. Med. 228: 157–161.
. 2014. Galectin-9 is rapidly released during acute HIV-1 infection and remains sustained at high levels despite viral suppression even in elite controllers. AIDS Res. Hum. Retroviruses 30: 654–664.
. 2011. Immunotherapy of murine retrovirus-induced acquired immunodeficiency by CD4 T regulatory cell depletion and PD-1 blockade. J. Virol. 85: 13342–13353.
. 2013. Combining regulatory T cell depletion and inhibitory receptor blockade improves reactivation of exhausted virus-specific CD8+ T cells and efficiently reduces chronic retroviral loads. PLoS Pathog. 9: e1003798.
. 2012. Are there benefits to starting antiretroviral therapy during primary HIV infection? Conclusions from the Seattle Primary Infection Cohort vary by control group. Int. J. STD AIDS 23: 201–206.
. 2012. Absence of HIV-1 evolution in the gut-associated lymphoid tissue from patients on combination antiviral therapy initiated during primary infection. PLoS Pathog. 8: e1002506.